Gambrel Shed free building plan. Build an 8 x 10 foot gambrel shed using the free plans at the link. Be sure to follow through to part 2 and 3. Build this lean to shed suitable for bikes or even gardening tools using these free woodworking plans. Build a garden shed using the free instructions available at the link. Build a simple shed for extra storage for your garden tools etc. This free plan is downloadable with lots of progress pictures. This is a link to a Google 3D SketchUp drawing for a garden tool shed. You will need the SketchUp software to download this drawing and its freely available online. This is a link to a Google 3D SketchUp drawing for a shed to fit a narrow space. You will need the SketchUp software to download this drawing and its freely available online. How to Build a Garden Shed. Create extra storage for outdoor gear with this simple shed design. 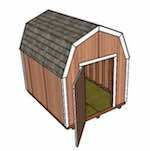 This is a link to a Google 3D SketchUp drawing for plans to build your own shed. Ours is 7 feet wide and 10 feet long but you can build any length you want. You will need the SketchUp software to download this drawing and its freely available online. This is a link to a Google 3D SketchUp drawing for the framing layout of an 8 x 10 foot garden or tool shed. You will need the SketchUp software to download this drawing and its freely available online.